Clare O’Donnell looking like Roberta Skilton. LAUREN ARNELL and DARREN FLANIGAN, both heavily involved in women’s footy with the AFL. 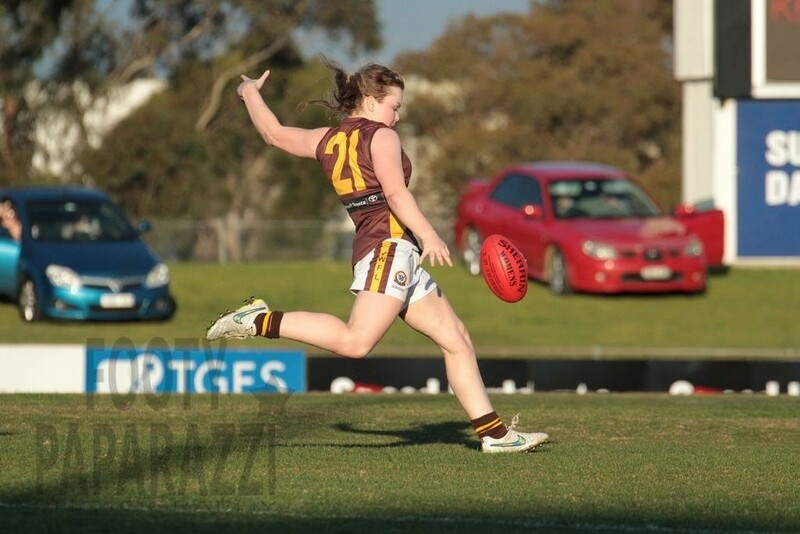 They’ll be joined by the team from the undefeated KEW BEARS women’s team (including Clare O’Donnell whose kicking action is reminiscent of her father’s – 35 years ago). Should be a ripping lunch. You need to set up one of those handball bull’s eye things that they used to have on World of Sport, and get the Kew Bears team members to have a shoot out competition. The winner gets some Patra Orange Juice and a pack of Four ‘n Twentys. Great to see the Almanac has lifted it standards getting Loz from the Falcons in as Guest Speaker! Hey Dips, good to see Clare in true colours! RK – At least I’m not yelling out “Go the Hawks! !” That would be too much. She puts the jumper on, dry retches, then gets on with it. Clare showing good form there Dips. 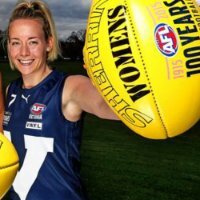 What would you do if she ended up playing for Collingwood?